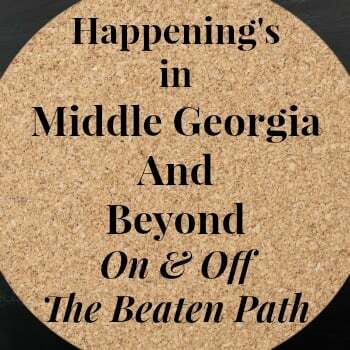 Keeping you informed of What’s Happening On and Off The Beaten Path in middle Georgia and beyond. Visit 10 Georgia Waterfalls Worthy of a Walk in the Woods to see all 10 with links for trip planning. Andersonville National Historic Site began as a stockade built about 18 months before the end of the U.S. Civil War to hold Union Army prisoners captured by Confederate soldiers. Today, Andersonville National Historic Site comprises three distinct components: the former site of Camp Sumter military prison, the Andersonville National Cemetery, and the National Prisoner of War Museum, which opened in 1998 to honor all U.S. prisoners of war in all wars. First Saturday June 6. Join a park ranger on a guided walk following in the footsteps of the 45,000 United States soldiers who entered into Andersonville prison from 1864-1865. FREE Tickets are required and may be obtained online Here. The Rock Ranch . Check the calendar for open dates when planning your trip to The Rock Ranch. Open Times: 10 a.m. to 4 p.m.
Conestoga Wagon Camping at The Rock Ranch. Peach Festival June 6 at North Peach Park. FREE concert with performance by Doc Holliday Band. 3D Fireworks Display will light the skies over Byron around 9:45 p.m, Free 3D firework glasses will be given out as long as the supplies last. Activities begin at 6pm at North Peach Park. Food vendors and peaches! Ride in air-conditioned, 1949 vintage train cars. (Admission applies. Call 229-410-7937 for group reservations and rates). Watermelon Express Train Ride (5hrs.35mins.) Enjoy this ride from our Downtown Cordele Depot to Historic Plains, the small Georgia town made famous by President Jimmy Carter. Thronateeska Limited (5 hrs. 30 mins.) After a short ride through the Sumter County countryside, we deboard in the small town of Leslie, home of the 200,000 square foot Georgia Rural Telephone Museum. Train tickets include FREE admission to the museum, where you will explore the largest collection of antique telephones and telephone memorabilia in the world. You will also see numerous antique vehicles and even a working cathedral pipe organ. Dairy Festival Saturday June 6. The festival is on the streets surrounding the courthouse. Events include Fun Run, Arts & Crafts, Parade, Food, entertainment and more. Peach Festival June 13. Downtown Fort Valley. Arts & Crafts, Food, Pancake breakfast, Concert, Parade, Kids Zone, World’s Largest Peach Cobbler and more. Concert featuring the Soul Purpose Band. Historic Macon Foundation Cotton Avenue Walking Tour. May 30 10am-11am George Muhammad will lead a walking tour along Cotton Avenue. Learn the history of what was once the commercial center for African Americans during segregation and its evolution. Tour limited to 25 people. RSVP required: 478-742-5084 or kcampbell@historicmacon.org. Like Historic Macon on Facebook. Living History Map. Explore the Living History Map managed by the Historic Macon Foundation. Explore a few of Macon’s most important historic places. These free clinics fill up fast so register early! Included are a free apron, goggles, patch and more. Douglas Theatre. 355 Martin Luther King Jr. Blvd. (478) 742-2000. NT LIVE’S “MAN AND SUPERMAN” SUNDAY, May 24th 3pm. $20. Academy Award® nominee Ralph Fiennes plays Jack Tanner in this exhilarating reinvention of Shaw’s witty, provocative classic. When Love Meets The Past June 6 at 5pm. $15. A play about lies, forgiveness and acceptance. Bike N’ Bites Throughout the month of May, the College Hill crew will be biking to local eateries for lunch. They would love your company! Each Friday, meet at the College Hill Alliance office (1083 Washington Ave.) at noon, with your bike and an appetite. Spring Movie Series Free movies at dark in Luther Williams Stadium in Central City Park. Bring blankets & chairs to sit on the green, or take a seat in the stands. Outside food and drink is permitted, but the concessions will be available for purchase. Sat. May 22 Ferris Bueller’s Day Off. Children Summer Workshop June 3, 10, 17, & 24 from 10:00-2:00. Reservations Required! Ages 6-12 ONLY! Please call (478) 752-8257 ext 222 to sign up your child. Children will participate in a 1 mile hike, learn how the Native Americans lived here. Learn how to make pottery, paint necklaces, and learn how play Native American games. National Get Outdoors Day June 13 from 10:00-12:00. Lake Tobesofkee Sandy Beach Water Park COMING SOON! Chamber Music Festival May 1-June 14. Madison-Morgan Cultural Center 434 S. Main Street Madison, GA 30650. Featuring concerts with both traditional and non-traditional chamber music. Performances by Canadian Brass member Brandon Ridenour, the stunning Grammy Award-nominated Eroica Trio, the iconic and award-winning bluegrass trio the Kruger Brothers band, prodigious pianist Daria Rabotkina, not the mention, international prize-winning Dover Quartet, and an evening with Entre Flamenco! $2 Off Wild Animal Safari at Pine Mountain. Go HERE for discount tickets. A Nation With A Purpose – America Rises From The Great Depression May 29, 10 am. Beyond Rosie: Women in World War II June 1- Aug. 28. 9am-5pm. Museum of Aviation located at GA. Hwy 247 at Russell Parkway is open daily 9 am-5 pm with Free Admission. Music & Dancing on the Mountain. June 20. Art in the Park. Saturday’s from 2pm-5pm. Hand crafted, local items for sale. Craft demonstrations. The Village at Indian Springs reopened April 4. You will find Big Chief Country Store, Daisy Pearl’s Boutique, Ladybugs & Tadpoles Children’s Store, Mrs. Lee’s Stagecoach Sweet Stop, Vintage Post Antiques & Gifts and Watkins Outfitters. Sew a Simple Doll July 18 & August 15. Learn to sew a Miss Poppet doll. The required doll kit is $7.99 plus tax. Family Farm Day Sat. May 23. 10:30-3:30. Learn about chores and skills from long ago, such as sewing, blacksmithing, woodstove cooking, gardening, woodworking and other farm activities. Did you know that you can check out Georgia State Park “ParkPass” and Historic Site Pass from your local library. Ask for the Park Pass to exempt the $5 parking fee. Ask for the Historic Sites Family pass which will cover up to four visitor at State historic sites operated by the Georgia Department of Natural Resources. Georgia State Parks Money saving Special discounts page can be found HERE. Georgia Aquarium located in downtown Atlanta. Exhibits and galleries include more than 10 million gallons of fresh and marine water and more aquatic life than found in any other aquarium. Sounds like lots of fun things to do down there! Thanks for sharing at What’d You Do This Weekend? I hope you will join us again next Monday! That was all very very interesting. I so love waterfalls, I enjoyed looking at those photos. Wagon camping looks like fun too. I love reading your Happenings in GA posts, Shirley. So many of the places I grew up visiting and enjoying are listed in this one. 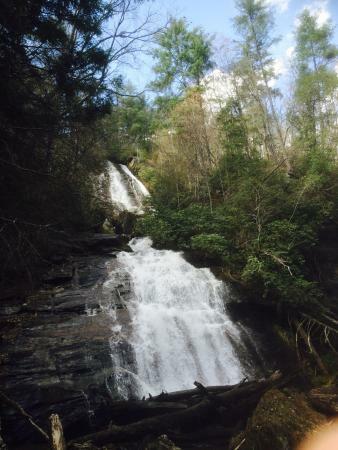 I think the waterfalls in the north GA mountains are spectacular. Anna Ruby is gorgeous and Amicalola Falls has always been my favorite. Thank you Beverly. Sometimes I get so lost in the research because there is just so much to do. The south has such rich history. Staycationers really ought to check out all the deals from State parks, such good deals!